It’s here!! Check out the NEW RWBY Trailer!! 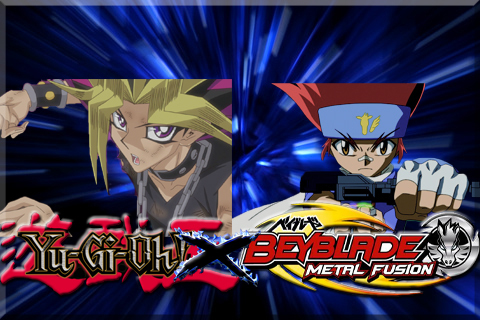 Yu-Gi-Oh X Beyblade Chapter 5!! Gingka, Benkei, Madoka, Kenta and Yu gawk at Yugi wide eyed. They cannot believe the story they were just told. Gingka has stopped eating the hamburger he ordered which is uncharacteristic of him. They had decided to go to Gingka and Benkei’s favorite restaurant to relax and have Yugi tell them his story. Yugi had just told them all about his world, about Duel Monsters, about the various tournaments and duels he and his friends participated in. He then told them about his meeting with Osiris, the Egyptian God, who is judging him to see if he is worthy of the final Duel and that he was likely sent to this world as part of Osiris’ test. Gingka and his friends took it all in. They stare back at him stunned by his tale. Though they have encountered their fair share of supernatural beings and ancient powers, they have never heard of anything this fantastic. Soon the silence is broken. “Well, that was a really intense story, Yugi,” said Gingka, grinning. “So you believe me?” Yugi asked. “I hear you. Anzu said the same thing not too long ago,” Yugi said. The smile he put on drops from his face. He begins to think about what kind of danger befalls his friends now that he knows they are captured by Osiris. Azeem had told him that they are safe but for how long. Yugi looks down at Anzu’s purse next to him. He can practically see her smiling face. Even Yami is saddened. “That’s right!” says Benkei. “We’ll help you beat this Osiris guy and rescue your pals!” Kenta nods in agreement. Yugi is overjoyed. When he first arrived in this world, he wasn’t sure if he’ll fine anyone who would help him. He even believed that revealing the truth would drive Gingka and his friends away. Yet, they are ready to stand by him, a total stranger. Yugi couldn’t be any happier. “Thanks you guys! I really appreciate it,” he says with a bright smile. “It’s our pleasure. It’s what we do,” Madoka says with a warm smile. “Just one question,” Yu says, drawing everyone attention. They look at short blonde haired boy. “How are you going find this Osiris anyway? You don’t even know where to look.” Yu has always been cynical and has a knack to pointing out things at some of the most inopportune moments. “That’s the spirit, Yugi!” Gingka said with encouragement. While the others gave their support to Yugi, Madoka hears her mini laptop beep. She takes it out and opens it to see that there is a message from Hikaru and the World Beyblade Association director Ryo Hagane, who is also Gingka’s father. She tells them about the message which gets everyone’s attention. “Hey Hikaru,” Madoka greeted the aqua haired girl. “Hey, Madoka, everyone. Listen—” Hikaru started before she is interrupted by Ryo. “Listen up, everyone! I, the Immortal Phoenix, have an announcement to make!” Ryo says dramatically while striking a pose. “Director!” Hikaru snaps at him sternly. Ryo quickly loses his composure. “Hikaru, I thought I asked you to call me the Immortal Phoenix,” he whimpered. “A Beyblade tournament?” said Gingka. Hikaru confirms this with a nod. “The announcement was just aired a few minutes ago. Here.” With a couple button presses from her pad, Hikaru brings up the broadcast. The video shows a room that resembles an Egyptian palace. The camera slowly closes in on a man sitting behind a large mahogany desk. He has a bald head, subtle eye make-up and large golden hooped earrings. Around his neck is an Ankh and he is dressed in deep purple suit. Jewel studded gold rings line his fingers. He gazes into the camera with steely eyes. Yugi immediately recognizes the imposing man. “That’s Osiris!” he exclaimed, drawing everyone’s attention. “Osiris? Are you sure, Yugi?” asks Gingka. “Yes, I am certain of it. He has my friends,” answered Yugi. “Let’s hear what he has to say. It might help us,” Madoka suggested. Everyone watches the video with anticipation. “Greetings. I am Victor Amadeus. As most of you know, I am a Beyblade stadium architect and have come to Japan in search of new real estate. I have just completed a new stadium in the eastern section of the city and wish to hold a Beyblade Tournament to…break it in. Unlike previous tournaments that have been held, there will be no entry or preliminary matches. Instead, I’m using this broadcast as a personal invite to the Beyblade World Championship winners—Japanese representatives Team Gan-Gan Galaxy, led by Battle Bladers Champion Gingka Hagane. I invite your team to battle against my bladers. I wish to see for myself the extent of your beyblading skills and judge you accordingly. Come to my new facility in the Eastern section of the city. And please,” Osiris pauses briefly and sharpens his gaze, “don’t forget your special guest.” And then the broadcast ends. “A personal invite?” said Benkei. “And from an Egyptian God no less,” Kenta added. Yugi smiles. “Alright,” he replies. “Osiris invited Gan-Gan Galaxy but Masamune is in America visiting Tobi and Zero. I can give a call to Tsubasa,” Madoka said. “I’m in too!” Kenta piped up excitedly. “Miss out on a Beyblade Battle? Are you kiddin’? !” said Yu with a big grin. “Alright, let’s get moving!” Gingka says. Yugi follows his newfound friends out of the diner and head toward the Eastern side of the city. He is happy that he has found kindness in strangers. To rescue his friends from Osiris, he is going to need all the help he can get. Gingka and his friends are more than willing to provide it. “It is fortunate that we found Gingka and his friends,” Yami said to Yugi from within the Millennium Puzzle. “It really is. I don’t think we would have gotten around or learn what happened to Anzu without their help,” Yugi replies. “Hey Yugi!” Gingka called to him, forcing them to end their conversation abruptly. “Come on! Let’s hurry up and save Anzu!” The smile on the flame haired kid’s face is friendly and inviting. Jonouchi has the same smile. A smile that makes them easily approachable. A smile that Yugi will see again. He quickens his pace to keep up with the group. At his office building, Osiris sits at his desk. He watches the monitor feed of the room where Yugi’s friends are being held. They appear to have given up their search for a way out. They are sitting around the room. Osiris has been watching them as well. Ever since Jonouchi touched the piece of the Millennium Puzzle he stole from Yugi. He would’ve deemed him unworthy if he had not returned the piece later that day after Yugi befriended him. The same goes for Honda who used to bully Yugi alongside Jonouchi until Yugi defended them when they were being bullied. Since then, Jonouchi and Honda have been nothing but supportive towards Yugi as well as the Spirit of the Millennium Puzzle. Osiris was impressed with this. He has watched Jonouchi, Honda and Anzu, whom he has no ill feeling for, remain at Yugi’s side during the Duelist Kingdom and Battle City tournaments. He was very attentive when Jonouchi jumped off the ship to Duelist Kingdom after another duelist threw the five cards to summon Lord Exodia over board. Osiris recalls how selfless the act was. That moment had him judge Jonouchi accordingly. The same goes for Honda. Osiris sees that Honda is also a worthy soul even though there are times when his faith wavers whenever he and those around him are faced with a tough challenge. In the end, Honda does provide support and will throw himself in the line of fire for his friends. Anzu Mazaki is the only one of Yugi’s friends that Osiris need not pass further judgement on. She has a kind heart and extraordinarily supportive of the other three. When he searched her soul, all he found was a girl who has been nothing but a faithful friend to Yugi even when they were young. He even sensed the slight attraction Anzu has towards Yugi. A smile draws across Osiris’ face as he keeps his eyes on the monitor. How he can use them to his advantage, he wonders. Yugi’s adventure in the Beyblade world begins here!! And have a go at my other fan fiction and novels! !